Try making this traditional Easter treat. "Hot cross buns, one ha' penny, two ha' penny, hot cross buns.". This page contains hot cross buns recipes. Hot Cross buns have long been a symbol of Good Friday. Today they are sold in bake shops and supermarket bakeries throughout the Easter season. Each bun has an icing cross on top to signify the crucifixion. Bread Machine: Place all dough ingredients except raisins and fruit in bread machine. Set on dough only cycle. Add the raisins and candied fruit at the signal for adding extra ingredients. Remove dough from bread machine at end of dough cycle. Place in a bowl, cover with a cloth and let it rest for 10 minutes. Combine yeast, 1 cup flour, sugar, salt and other spices. Separately, combine milk and water; heat to Combine dry ingredients mixture, liquid ingredients, and butter in a large bowl. Beat for 2 to 3 minutes at medium speed. Add egg; beat 1 more minute. Stir in raisins, fruit, and enough remaining flour to make a firm dough. Knead dough on a floured surface for about 5 to 7 minutes or until smooth and elastic, using additional flour if necessary. Place in lightly greased bowl; turn over to grease the other side. Cover and let rise. After 15 minutes, check dough to see if it has risen sufficiently and is ready to be shaped. Gently stick two fingers in the risen dough up to the second knuckle and take them out. If the indentations remain, the dough is "ripe" and ready. Divide dough into 12 pieces. Shape pieces into balls and place them 3 inches apart on a lightly greased baking sheet. Cover and let rise in warm place until almost doubled, about 45 minutes to an hour. Bake at 375 degrees F for 15 to 18 minutes, or until light brown on top. Remove from oven. Place baking sheet on a wire rack to cool. Prepare the glaze and spread over warm buns. Let buns cool completely on baking sheet. Fill a cake decorating bag, fitted with a round tip, with icing. Pipe an icing cross on each bun or simply spoon and spread icing on each one in the shape of a cross. Boil 3/4 cup sugar, 1/2 cup sour cream, 2 Tbsp. orange juice about 3 minutes, stirring constantly. Spread over orange buns. Can anybody help me with a good old fashioned recipe for Hot Cross Buns. The ones with plenty of spice and fruit like we used to get. Instructions: In a small saucepan, heat milk to very warm, but not hot (110 degrees if using a candy thermometer). Fit an electric mixer with a dough hook. Pour warm milk in the bowl of mixer and sprinkle yeast over. Mix to dissolve and let sit for 5 minutes. With mixer running at low speed, add sugar, salt, butter, cinnamon, nutmeg and eggs. Gradually add flour, dough will be wet and sticky, and continue kneading with dough hook until smooth, about 5 minutes. Detach bowl, cover with plastic wrap and let the dough "rest" for 30-45 minutes. Return bowl to mixer and knead until smooth and elastic, for about 3 more minutes. Add currants or raisins and knead until well mixed. At this point, dough will still be fairly wet and sticky. Shape dough in a ball, place in a buttered dish, cover with plastic wrap and let rise overnight in the refrigerator (see note at right if you're in a hurry). Excess moisture will be absorbed by the morning. In the meantime, pre-heat oven to 400°. When buns have risen, take a sharp or serrated knife and carefully slash buns with a cross. Brush them with egg white and place in oven. Bake for 10 minutes, then reduce heat to 350°, then Bake until golden brown, about 15 minutes more. Transfer to a wire rack. Whisk together glaze ingredients, and spoon over buns in a cross pattern. Serve warm, if possible. 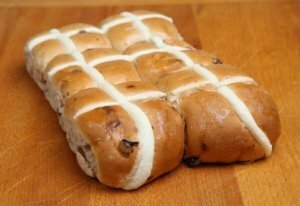 Does anyone have a recipe for hot cross buns that I can make for a diabetic? All recipes I found use sugars and I would really like to surprise a friend who was recently diagnosed. Hot cross buns are her favorite, so I need a revised recipe. Thanks. I to am careful about sugar. I have made yeast rolls using splenda and half white whole wheat flour and half white flour, but the best thing to do is go to a diabetic site so you can get the carb count. It is not just sugar but also carbs that count, Some people use almond flour to lower carb count too. Just remember it is the love that you put in it that counts.